Since cosmetic plastic surgery became prominent and popular, one procedure stands out as being the most recognizable: The facelift. A facelift is a general surgical procedure that is employed to reduce facial wrinkles, remove wrinkles, eliminate signs of skin aging, and “lift” the skin and muscle around the face and jaw area, hence the name “facelift”. Facelift surgery aims to remove excess fatty tissue, smooth loose and excess facial skin, and to tighten the facial muscles underneath the face. Some of the best plastic surgeons can perform this with very minimal scarring, oftentimes it is barely noticeable or hid properly along the lines of the face. The facelift begins with the surgeon applying the necessary anesthesia and sedating the patient. Next, they makes an incision above the hairline to separate the facial skin from the tissue underneath. 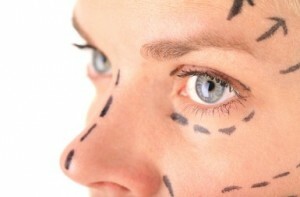 Incisions can also be placed within natural facial creases, like the line where the ear meets the face. This aids in minimizing visible scars when the patient fully heals. Once the necessary areas are exposed, excess fat and skin are removed. Next, the surgeon tightens muscles and improves the contours of the patient’s face, and sometimes the skin is tightened and “lifted” to give a youthful and rejuvenated appearance. Once all the necessary procedures are done, the skin is repositioned and placed in their proper areas, and secured with stitches, or staples, or both. Once everything is secure, the area is wrapped in bandages. Because of the swelling and bruising that will occur, and the existence of the bandages, the end result will not be fully visible until the patient recovers. Facelift recovery will last several weeks to a month, during which time the patient can feel pain, which is why it is important that the patient diligently follows the surgeon’s instructions and regularly takes the prescribed medications, antibiotics, and painkillers. This will aid in hastening the recovery process and ensures there are as little side effects as possible. When the swelling subsides and the patient has fully recovered, the end result will be a rejuvenated face. By removing the excess fat and skin, any previous areas with obvious sagging and wrinkles are refreshed, and because of the tightening of the muscles, the patient’s face will have a more firm and younger look. Because of the number of incisions and the type of operations needed in facelift surgery, facelift costs can be higher than most procedures. It can also be very invasive, especially for older patients, those in their 30s or 40s. The intensity of the procedure also depends on the patient’s age, which also determines the end result and the recovery time needed after the surgery.